Cough Drop Pep Talk for Thanksgiving? Do I really need a cough drop pep talk for Thanksgiving? Why does my cough drop wrapper say, “A PEP TALK IN EVERY DROP” anyway? 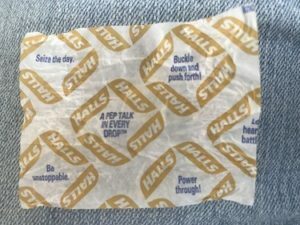 If I have fever high enough to think cough drops talk, I need something besides a pep talk. The pesky little ovals don’t stop there. They advise me to “Buckle down and push forth!”; “Power Through!”; and “Seize the day.” Whaaat? Maybe I’m just in a bad mood because I can’t sleep, my throat hurts, and my ear is full of fluid. Eating green beans, cauliflower, sweet potatoes, and oranges may be culinary medicine, but they aren’t doing the trick to kick this virus. Now, I’m out of food and I don’t want to get out in the cold to go to the store. Should I take the cough drop wrapper’s advice and power through? After all, I just have a cold, not the flu. OMG, I’m rhyming in a blog post – I must be sick. That aside, I don’t like clothes with affirmations on the tags or wrappers that tell me what to do. It’s not that I mind affirmations, I just don’t like them in my clothes. It makes me feel like a walking fortune cookie. And it’s not that I don’t sometimes need to be told to buck up, I just don’t want that advice from something I take when I’m sick. It seems inappropriate. If the wrapper said, “A delicious complement to hot tea.” or “Stay home and sleep.” or “A warm snuggle for your throat!” or “Take time to heal.”, perhaps I could get behind wrapper advice. But telling me to be unstoppable is really bad advice when I’m ill. The people following that advice are more likely to go to work, church, and the store, sick. They’re more likely to stay stick longer. They’re more likely to be too tired to do their best at work or be as safe a driver as usual on the road. And no doubt they will contaminate the air on my next flight. So stop encouraging them already! Most of us have been programmed to keep going when we would get well faster if we went to bed and got some rest. We feel like we can’t miss work or class, a family birthday, or a soccer game. Many bosses are happy to reinforce this belief. And then there’s all of that holiday cooking to be done! That’s certainly something we shouldn’t be doing when we’re sick. Seriously, preparing food for others when you’re sick can expose them. Most states have food prep guidelines for restaurant employees that include restrictions for those with cold, flu, and bronchitis as well as more serious illnesses. I know it’s tempting to minimize the risks when we think of beloved holiday traditions, but if someone in your family has a compromised immune system, exposure to the flu could put them at serious risk even if they’ve had the vaccine. Having a medically fragile grandchild has increased my awareness of the need to be mindful about spreading germs. It also means I felt the frustration of missing out when the family welcomed her home from a recent hospitalization. Perhaps those cough drop pep talks are meant to encourage malingering patients to get back to the business of every day, but they’re most likely to feed the determination of those who won’t stop in the first place. If we want to assist our immune systems, it is important to recognize the value of down time. Resting leaves our bodies with more energy available to fight off bugs and rebuild cells. So, if you’re sick this holiday season, forget the cough drop pep talk! Eat some soup. Order food. Go to bed. Take time to heal. Not only will you get well faster in the long run, you’ll help contain the spread of viruses and/or bacteria. Now it’s time for me to follow my own advice and take a healing nap!!! Hosting Thanksgiving is easy when you set intentions. Are the holidays really right around the corner? They must be because I’m sitting here planning my Thanksgiving menu. It’s been awhile since I’ve done an all out Thanksgiving production and I’m wondering just how big it should be? I know the point of the holiday is not the food, but I always look forward to a table full of freshly made dishes that I prepare only once a year. There’s no crossover between my Thanksgiving and Christmas menus because we celebrate Christmas with breakfast rather than dinner. 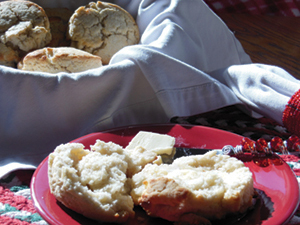 Just thinking about that makes me want a steamy hot biscuit with strawberry jelly, but that’s beside the point. Or maybe it’s not. Sometimes it’s the simplest things that we long for most – my Aunt Opal’s cherry pie, my grandmother’s beef and noodles, my mother’s cinnamon rolls made from canned biscuits. For you it may be the chicken soup your mom fixed when you were under the weather, or the grilled cheese sandwich she grilled with butter and served with tomato soup. Obviously, it’s cliché to say that food tastes better when it’s made with love, but any dining experience is enhanced when the food is made by someone who cares how we feel; someone who shows up for Thanksgiving with a pie because they like to spend time with us; someone who hopes to bring us comfort. Offering and sharing food is one of the ways we express love beginning the first moment we hold our babies close to feed them. There’s a scene in the movie “The Blind Side” that shows the Tuohy family focused on football and TV rather than each other on Thanksgiving Day until they realize their house guest Michael Oher is sitting at their dining table by himself. Seeing him there as alone at their table as he is in life, they are moved to gather around and share the meal with him. This sharing enriches the family and the bond they are forming with Michael. It’s a great illustration that we inherently understand breaking bread is an action affirming trust, confidence, comfort, and acceptance within a group. 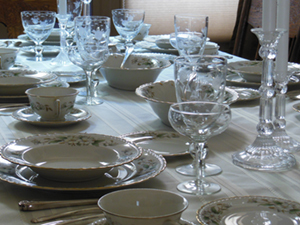 For the host, a holiday meal, or any family gathering, is a delicate balancing act. If you go all out cooking for days making everything from scratch and no one seems to notice, it can be disheartening. If you go to a restaurant because you’d rather focus on the family than the food, you risk the ridicule of someone who thinks you’re being lazy or don’t care about family traditions. Which brings me back to the decision at hand. How large should I make this Thanksgiving’s production? No matter what I’m deciding, I like to start by settling on some intentions. I’ve done this enough to recognize that my intentions will automatically reflect my priorities, so setting intentions and determining priorities are a simultaneous process (there’s a time saver right there). Setting intentions rather than goals gives me a path to feel successful even if the soufflé collapses and the pie crust is soggy. So, what are my intentions for Thanksgiving? I’m going to start with being kind to myself. That looks like not doing too much. It’s not unusual for me to work so hard to provide for other people that I feel worn out, so I have to be deliberate in my intent to prevent over-doing. Luckily, my sister has offered to bring dessert and rather than ask for pie, I asked for pie and cake. My daughter-in-law’s parents will also be joining us. Her mom offered to bring two vegetables. Instead of trying to make it easier for her by limiting it to one, I happily accepted the offer. Next, I intend to make a workable timeline so I’m not rushing and flustered at the end. If I’m in a panic to get things done, I’ll be irritable and unable to enjoy my guests. Today I’ll review my menu and determine what can be done in advance and when I will do it. For the past two months, my now 4-month-old grandson has spent two to three days a week with me. When he’s here my work time is limited because he needs lots of tummy tickling. He’ll be here this week and next week, so a timeline is even more critical than in past years. I intend to scale the menu to fit the time available. If that means there’s no pecan pie or fewer leftovers, then so be it. It won’t be the end of the world, and it won’t cause me to feel as though I’ve let anyone down. I intend to tailor the menu to my guests’ dietary needs. There are only 8 of us this year, so I’ve had a chance to poll everyone to make sure each person will have plenty of options on the table. 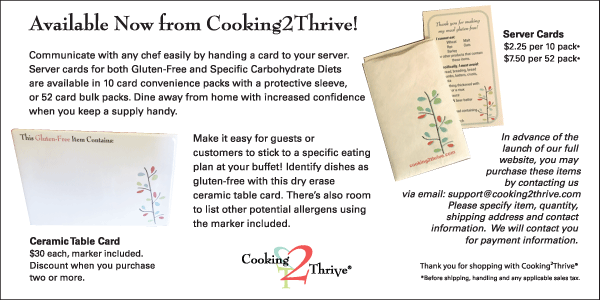 I have a friend who keeps a set of index cards noting the dietary restrictions and food dislikes of her close friends and family. As her guest, this makes a gathering easy to enjoy and I appreciate the thoughtfulness. I intend to make everything from scratch. I am not suggesting that you should do this. For me, it means the food is more delicious and automatically free of preservatives, coloring, stabilizers, and artificial flavors. It also means I can control the amount of sodium and fat and be confident that everything is gluten-free. I intend to make the table-setting beautiful, but simple. Using my grandmother’s tablecloth, real china, and beautiful serving pieces means candles or a simple bouquet will be all I need to add. Even though I can’t put china in the dishwasher, I like to use it for holidays plus I intend to let my kids wash the dishes. On years when I’ve had 25 guests, I’ve been known to sit the china atop folding tables covered in brown kraft paper scattered with crayons. Hey, I like weird juxtaposition and I have a lot of china. I intend to be present in the moment once the guests arrive. Enjoying the company is more important than the food, the table, or the mess I just left in the kitchen. My dining room is separate from the kitchen so no one has to look at cluttered countertops while we’re eating. I intend to make time for yoga and rest on Friday before driving to share leftovers with extended family. I intend to make a list of things for which I’m grateful. It’s been a difficult and emotionally exhausting year. Remembering that even such a year has brought many things for which I’m thankful is a great way to refocus my energy on the positive. With these intentions, I feel confident I’ll have a great Thanksgiving. My food may not be perfect. My front porch may not get swept. There may be a drop of dough on top of the stove or flour on the floor. None of that will matter. I will be able to let it go and focus on gratitude. If you’re feeling dread or pressure about hosting Thanksgiving, consider setting intentions to make it easier. I can tell you from experience, it makes a huge difference for me. Holiday Indulgence–Is It Worth It? For those of you who are tempted to fudge a little here and there, I recently asked myself this question–Was a recent holiday indulgence worth it? After 9 months of strict adherence to the Specific Carbohydrate Diet, Thanksgiving arrived. I cooked sweet potato pie, corn casserole, cornbread dressing (stuffing if you prefer), an amazing sweet potato and squash soup, and gluten-free macaroni and cheese for my extended family. While I cooked, I tasted. At the dinner table, I tasted. For a couple of days afterward, there were leftovers in the fridge that…I tasted. Now mind you, a taste isn’t a serving. It’s just a couple of spoons full, and I never tasted anything containing harmful gluten. 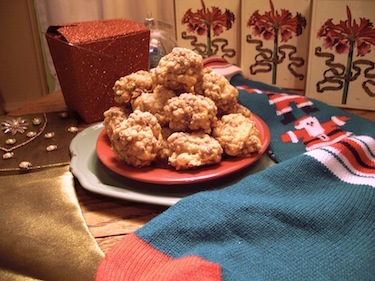 Then came the cold December afternoon when I returned to my office ready for an afternoon snack. No, not just ready…I felt like I was starving. While I was out of the office, the most beautiful, red holiday basket had arrived. Sporting a huge bow and from the most exclusive flower shop in town, it was filled with chocolate chip, key lime, and iced spice cookies, party mix, candy, and one gluten-free item – a tin full of dark chocolate hazelnut toffee. Not more than 5 seconds after I finished reading the label, I ripped off the plastic seal and popped open that tin. After all, I was starving and there were huge hazelnuts embedded in the toffee. I broke the toffee away from a nut and popped it in my mouth. After all nuts are allowed on the Specific Carbohydrate Diet. Still hungry, I continued. The third nut I peeled had a tiny bit of candy still attached. Chocolate, caramel tasting sugar – YUM! I didn’t try nearly as hard to remove all the candy from the fourth nut…or the 5th, 6th, or 7th. After all, it was only sugar (not gluten) AND I had been strictly following the SCD, perhaps I was ready to reintroduce some items into my diet. This justification worked so well for me that I used it again the next day when I pulled the lid off the tin. Then came Christmas lunch. May as well try the scalloped potatoes, and then finish off the toffee. Four days later I have two New Year’s parties to attend and I am doubled over in pain or I would be if I weren’t talking to the repairman who’s here to fix the alarm. I can’t believe I used to work like this all the time. It feels like someone detonated a bomb below and to the right of my belly button. I’m contemplating the minimum amount of time I can spend at each party because I’m afraid I may need to stick close to a bathroom. I plan to take a second dose of activated charcoal and hope for the best. In the midst of this pain and anxiety, I hear the question nagging at the back of my brain: Was straying off the SCD worth it? Hmmm. The toffee was delectable, and the potatoes satisfied my longing for filling carbohydrates, but now I’m on track for what may be a lengthy healing process. Hmmmmmmmmmmm. Was it worth it? YES. Yes, the transgression was worth it. Ahhh yes, the transgression was worth it, but not in the hedonistic way you may think. It was worth it because the discomfort I am experienced reminded me in a very concrete way WHY I choose each moment of every day to adhere to an eating plan which allows my body to heal. Such discomfort also serves as a reminder of how difficult it used to be to focus and function before I went gluten-free. I feel amazed and proud of my progress. And I feel proud of you for wanting to feel your best and for being willing to make choices that will keep you on the path of healing. To be tempted is to be human. Give yourself a break if you weren’t perfect last week, but don’t use yesterday’s mistake as an excuse to give up on yourself or to stop making good choices. Just use it as a reminder of WHY you choose to consume only foods that contribute to your optimum health.